Semi-desert. Canyons, rocky openings, shrublands. Spring. 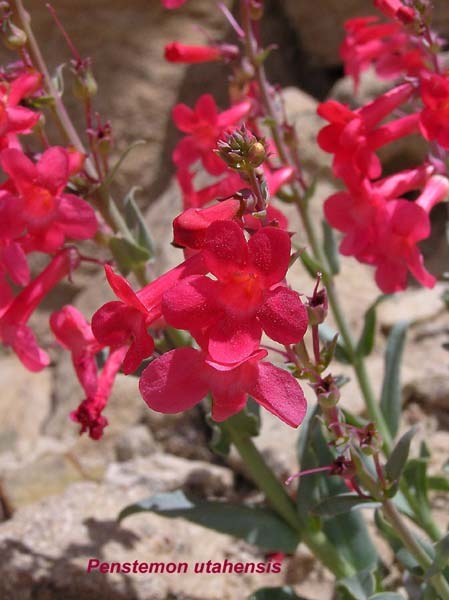 Penstemon utahensis can be recognized even from a distance by its unusual shade of hot red-pink and its habit of growing in large colonies on hot dry slopes. A closer inspection reveals other distinguishing characteristics: its flowers are almost always horizontal (perpendicular to its stems, not drooping) and the five flanges of its deep flower tube (the corolla lobes) are flattened in one plane perpendicular to the tube. One does not have to bend and twist to see Penstemon utahensis; the flower lips brightly face you. Alice Eastwood collected this plant near Monticello, Utah in 1892 and she described and named it in 1893.